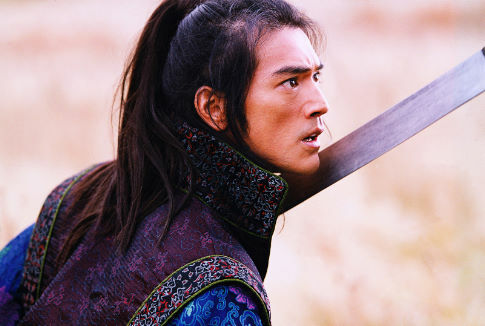 IT ONLY takes Takeshi Kaneshiro to stand with his coat just off his shoulders for one of his entourage to leap up to remove it. Itâs superstar behaviour, but then the 31-year-old actor has parlayed his brooding good looks into becoming a pin-up, Prada model, pop idol and film star whose career straddles action and art house. Heâs already been dubbed the Asian Johnny Depp. Now the Taiwanese-Japanese actorâs profile in the West is about to be raised with Zhang Yimouâs House of Flying Daggers, which continues the directorâs shift from neorealist rural portraits (Red Sorghum) and acclaimed period dramas (Raise the Red Lantern) to the recent martial-arts epic Hero .That film was a bouquet of elaborate aquamarine costumes, emerald-misted forests and golden-russet foliage. Daggers is another feast of blood, passion, lighter-than-air martial arts, silk brocade and leading players as eye-catching as the filmâs vistas. Kaneshiro and the Hong Kong star Andy Lau play Tang Dynasty government officers, Jin and Leo, whose loyalties come into question when their pursuit of a beautiful rebel spy, Mei (the rising Chinese actress Ziyi Zhang, who now prefers this Westernised order of her name) turns into a love triangle. Dagger’s casting reflects a growing trend to bring together Asia’s biggest names to maximise a film’s market (and so boost its budget) without relying on the American box office. The film became the second highest grossing movie in China, behind Hero, which itself has now taken $175 million worldwide. Kaneshiro is well placed to enjoy this burgeoning “pan-Asian” approach to film production. Born and raised in Taiwan, one of three sons of a Japanese businessman and Taiwanese mother, he speaks Japanese, English and three Chinese dialects. He had no clear ambitions as a child (“I just played a lot”), but at 17 he starred in a soft-drinks commercial, which led him to being in a Taiwanese boyband called the Little Four Heavenly Kings. The titles of his subsequent solo albums — Just You and Me, Ideal Lover, Tender Superman — reflected his growing persona as a pretty but virile lonelyheart that teenagers could fantasise about. The Hong Kong auteur Wong Kar-Wei then cast him as a lovesick undercover cop in Chungking Express (1994). The film not only established Wong as the pop poet of night-time Hong Kong but also made it clear that Kaneshiro w as an actor to watch.